A Vancouver city council has voted unanimously to start working on what could become a ban on the sale and trade of shark-fin products in much of Metro Vancouver. 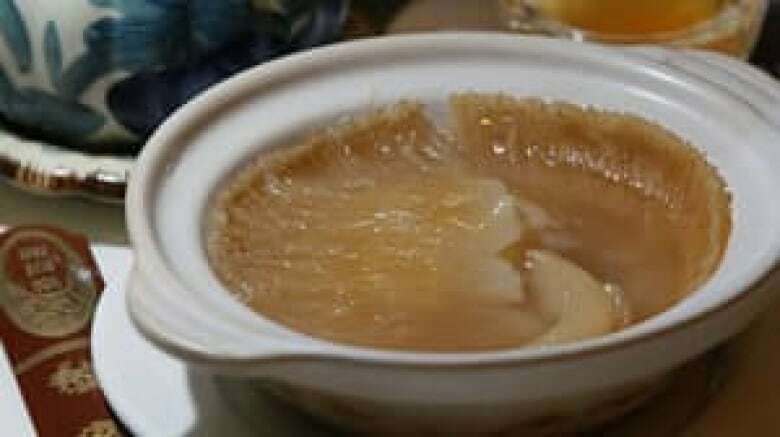 Shark fin soup is a traditional delicacy served at Chinese wedding banquets. (The Canadian Press) Vancouver city council has voted unanimously to start working on what could become a ban on the sale and trade of shark-fin products in much of Metro Vancouver. Councillor Kerry Jang said Tuesday that Vancouver's decision to work with the neighbouring cities of Burnaby and Richmond on a shark-fin sale and trade ban is a major move in saving sharks from extinction. City staff have already had informal discussions with Richmond and Burnaby, he said. The proposed ban also marks a huge step forward in cultural relations with the Chinese-Canadian community, which has long-standing traditional ties to shark-fin delicacies, Jang said. Anti-animal cruelty groups say more than 70 million sharks are killed each year through the practice of finning, which involves cutting off shark fins and tossing the sharks back into the water to die. Jang dug two old, dried shark fins out of his mother's closet house to use as props in his presentation to council, saying he wanted to show the ban isn't an effort to demonize anyone and to illustrate the traditional and ethical bridge that needs to be crossed in the growing debate. He said the fight against shark fin sales is not a swipe against Asian cultures, but is a drive to prevent extinction of a species. Jang will also be supporting a similar motion at the annual Union of B.C. Municipalities when delegates gather in Victoria next week. Several B.C. cities, including Coquitlam, Port Moody, North Vancouver City and Maple Ridge already have some sort of ban in place, but many restaurants that serve the fins are in Vancouver or Richmond. Toronto and Calgary have also banned the sale of shark fins, provoking protest from parts of their Chinese communities. The dried fins are considered a delicacy in Chinese cuisine and restaurants and caterers charge up to $100 per bowl for shark fin soup, making it a status symbol for those who can afford to consume it or feed it to their guests, particularly at weddings. Jang said he expects Vancouver councillors will vote on a shark-fin ban law within one year. Should shark fin soup be banned across Canada?